Last week we shared a note with coalition allies about the devastating act of violence in Orlando and transformation of our building here in Washington, memorializing the 49 LGBTQ people and allies -- almost all Latinx. 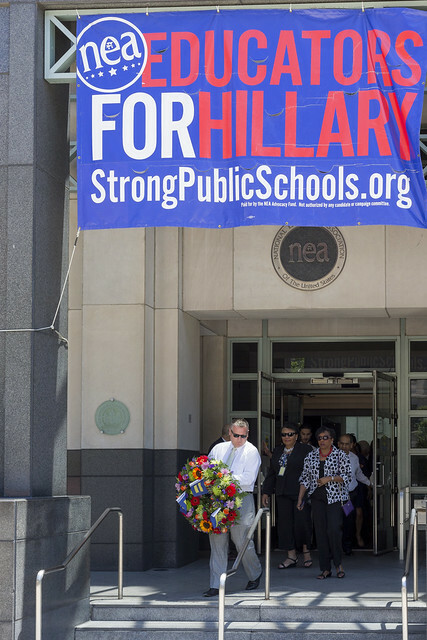 Yesterday, more than 100 members of the National Education Association (NEA)-- which has worked closely with us and other LGBTQ advocates on behalf of their members and the students they serve -- came to pay tribute. Starting at dawn Friday morning HRC began hanging large-scale images of every victim in 49 windows of our building, looking out toward 17th St. Passersby have been invited to share on a remembrance board messages honoring the victims, and HRC is also handing out memorial programs with the photos, names and ages of the victims. All day and all weekend visitors stopped - in person, via phone and virtually. Yesterday's visit by 100 brothers and sisters from the NEA, including Executive Director John Stocks, who came in person to pay their respects to the 49 lost in Orlando was a special visit. What a powerful moment to see Vice President Becky Pringle and Secretary Treasurer Princess Moss lay a wreath at the Memorial. We shared hugs and tears and a deepened resolve to fight together to say yes to love and no to hate. It was a message NEA President Lily Eskelsen García led with in a powerful blog post responding to the Orlando tragedy. Thank you NEA. And thank you to all teachers -- teachers all over this country who are on the front lines making safe spaces for all our young people regardless of race, religion, sexual orientation or gender identity. Based on many many requests we have decided to keep the Memorial up at the HRC headquarters through next Sunday, the two-week anniversary of the tragic shooting at Pulse. All are welcome.